Long enjoyed by Italians, beautiful Halaveli is now open to everyone alike. 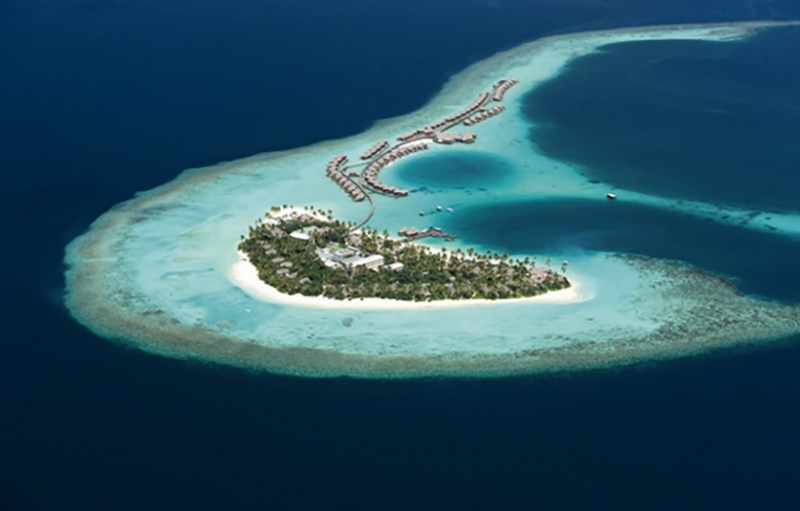 Constance have taken the island over and brought their Indian Ocean 5 star expertise to the Maldives, creating something opulent yet accessible and familiar. This is not an ostentatious place but you feel its quality as you settle in, use the facilities and receive genuine care and attention. It has always been an aristocrat among Maldivian islands. The ‘straight’ side of this D-shaped island looks into an ideal lagoon for children - crystal clear, gently sloping and soft underfoot. The beach is very good and goes all the way around the island although narrower on the curved side. The reef is easily reached on this sea-facing side tosnorkel. Surprisingly, the snorkeling is good, not excellent. 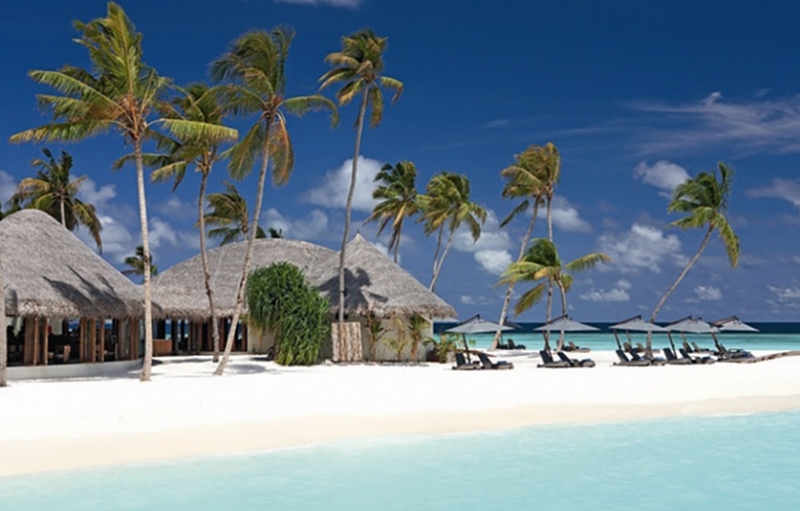 Ellaidoo and Maayafushi are neighbouring resorts that attract hard-core divers, keen to minimise expenses. Halaveli is the luxurious way to enjoy the great dive sites. 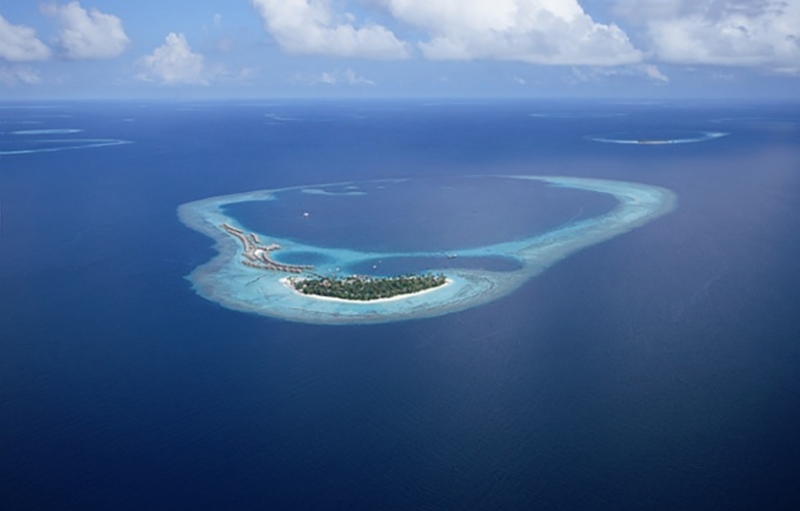 A short boat ride away are 4 Protected Marine Areas: 2 key shark points and 2 spectacular thilas. A number of channel dives are also just a few minutes away. There is even a ‘house wreck’ just 20 metres off the housereef. The dive base, the main boat jetty and the water villa jetty are all on the straight side, facing west into the lagoon. This makes it visually busy for the 8 Beach Villas on this side and for the early Water Villas, but you can see the sunset everyday. Otherwise you can go to the Sunset Bar, half way up the water villa jetty. 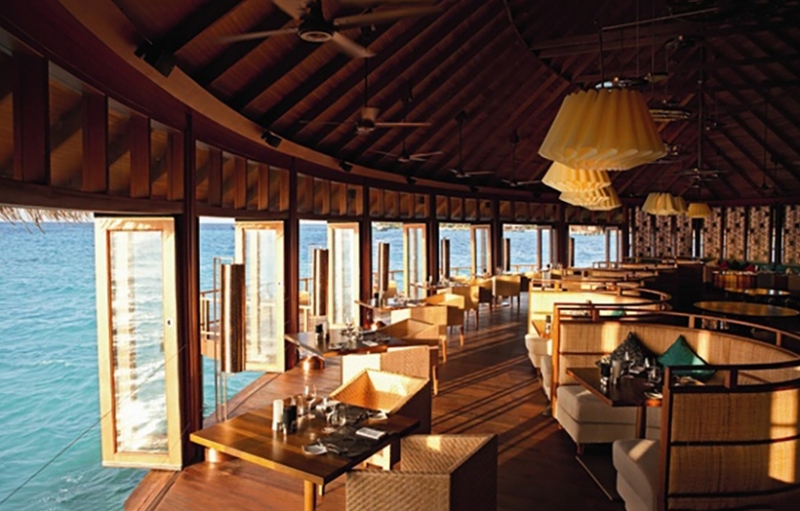 With a deep, curving verandah and beautiful, restrained decoration, this is a delightful place for a sundowner. A resident mixicologist does a spectacular job of making up both classic cocktails and new ones. 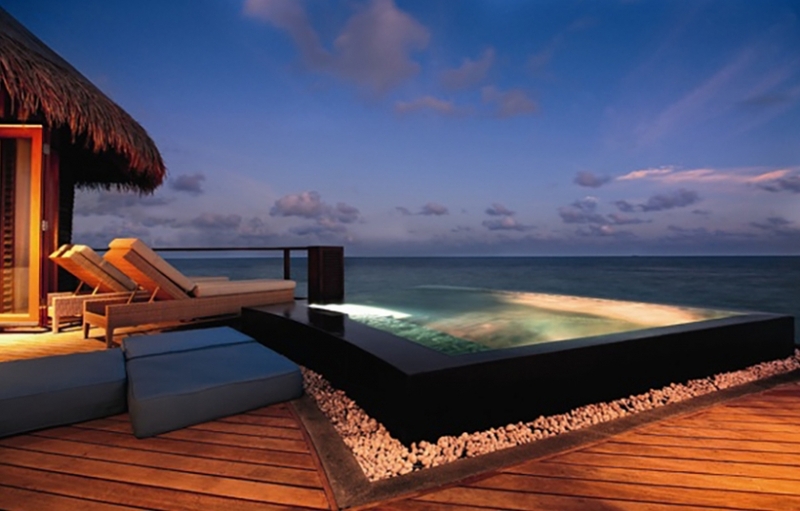 The water villas on past the sunset bar are the most requested. They are quieter, but they are also distant. This is the longest such jetty in the country and at 850 metres it is a good bit longer than the 500 metre island. The speciality restaurant, next to the Sunset Bar, serves imaginative Asian cuisine with European touches, such as Thai Green Curry Risotto. 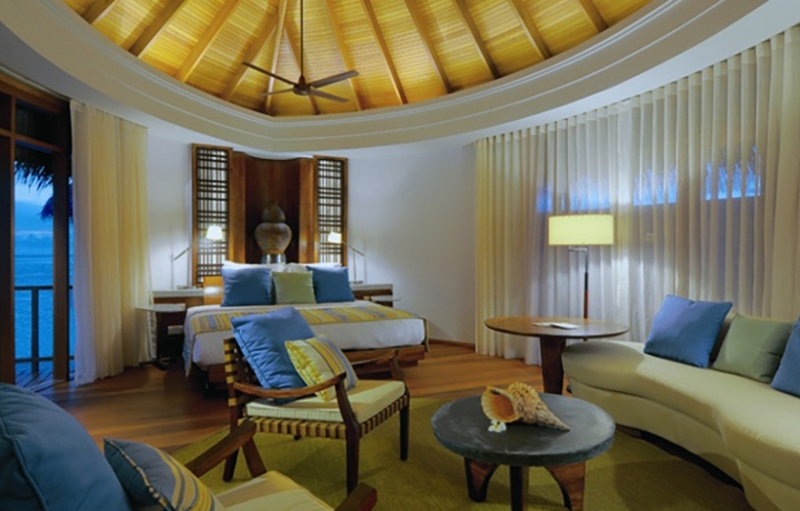 The setting is impressive, with a domed roof and sweeping curved glass walls looking out to the lagoon. Although the wine cellar is small, there is a sommelier for each of the 3 restaurants. 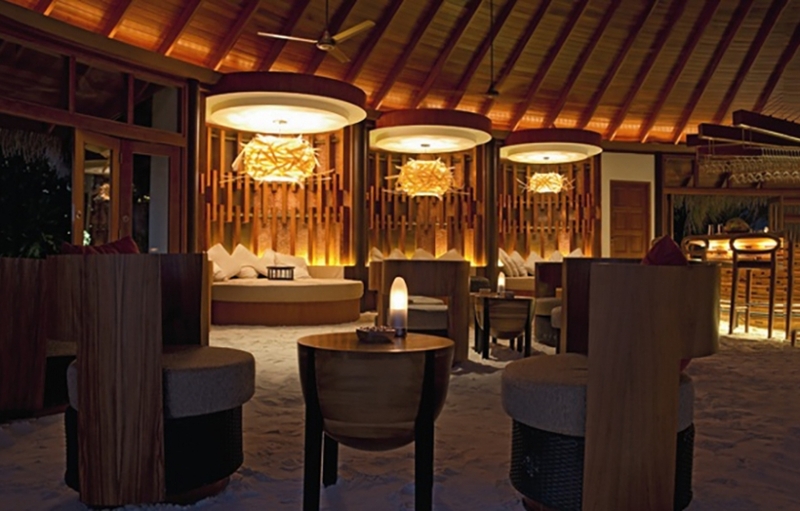 The spa is near the bar and restaurant on the water villa jetty and it is quickly obvious why it is such a successful place for the resort. 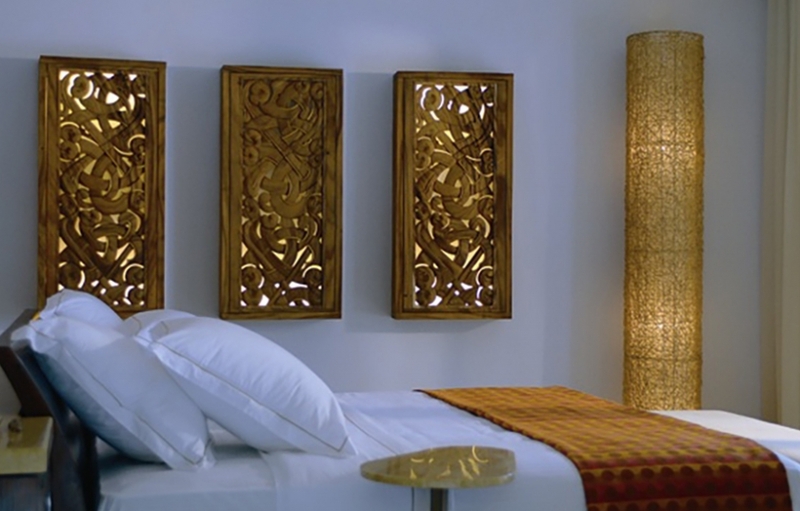 There are double rooms, single rooms, a Thai treatment room, an Ayurveda room and a beauty salon. 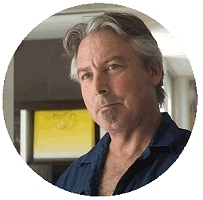 The products are organic, made in Thailand for Constance Halaveli and the treatments are varied and thoughtful, including a variable package for honeymooners of massages, scrubs and wraps that lasts at least 2 hours. The treatment rooms are curved and wood paneled, with cushioned seating both inside and outside on the over-water deck, promoting a time and space for togetherness. 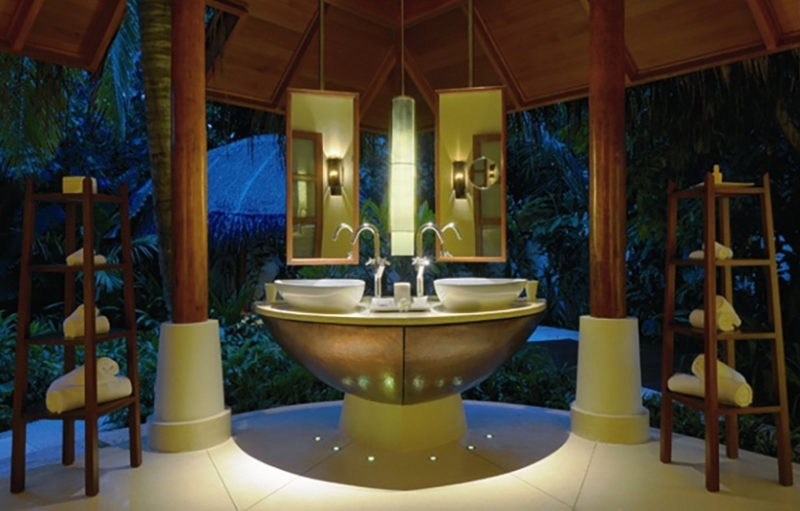 The curved shape of the traditional dhoni is used as a design element throughout the resort, bringing a natural elegance and reflecting the cultural history of the Maldives. Naturally again, the whole resort is under thatch. On the other hand, the interior decoration is not rustic, it is modern but not minimalist. 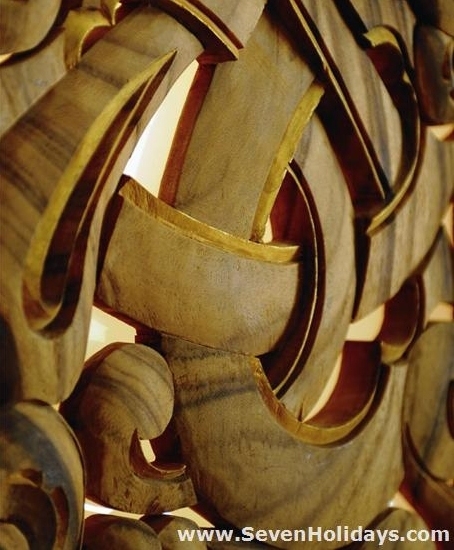 Nature is brought inside with a tropical leaf motif used on textiles and cut out of brass for decorative light fittings. 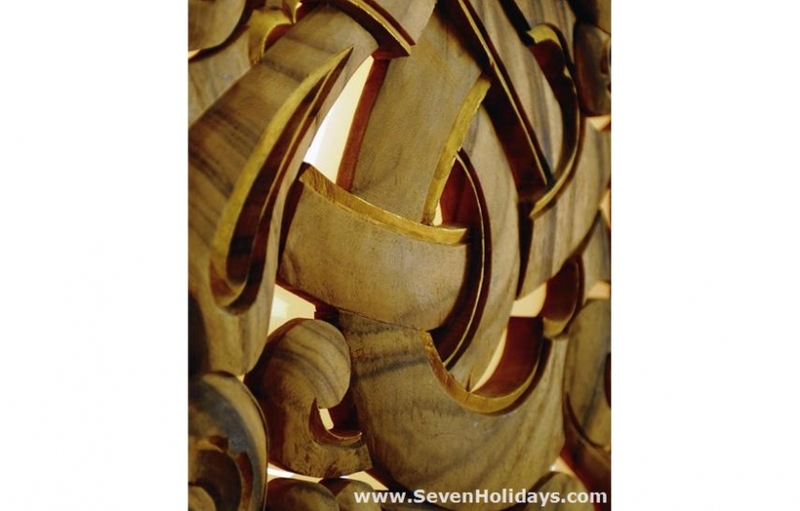 Maldivian culture is echoed in wooden panels copying the forgotten craft of coral carving. All these elements come together in handsome and very generously sized rooms. 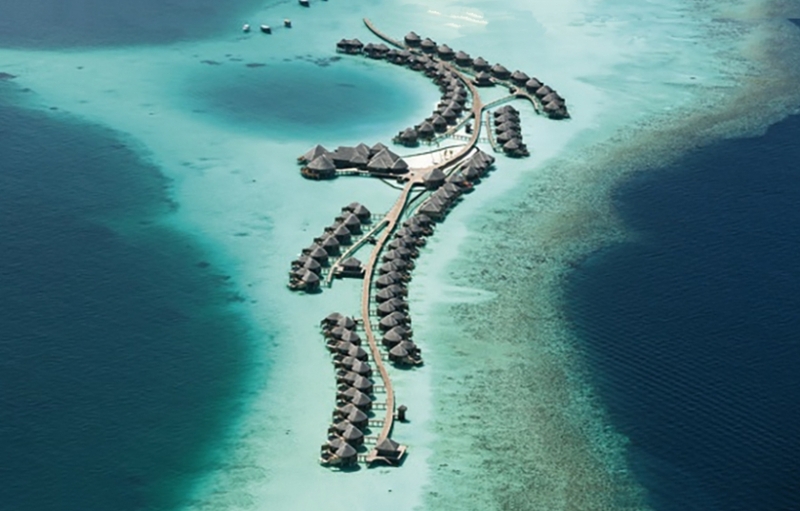 The 57 Water Villas are 100m2, the 20 Beach Villas are 350m2, the 8 Double Storey Beach Villas 410m2 and the Presidential Beach Villa is 700m2. Every room has a plunge pool, while the beach rooms have inside-outside bathrooms, deep wooden decks and a pretty, private garden. 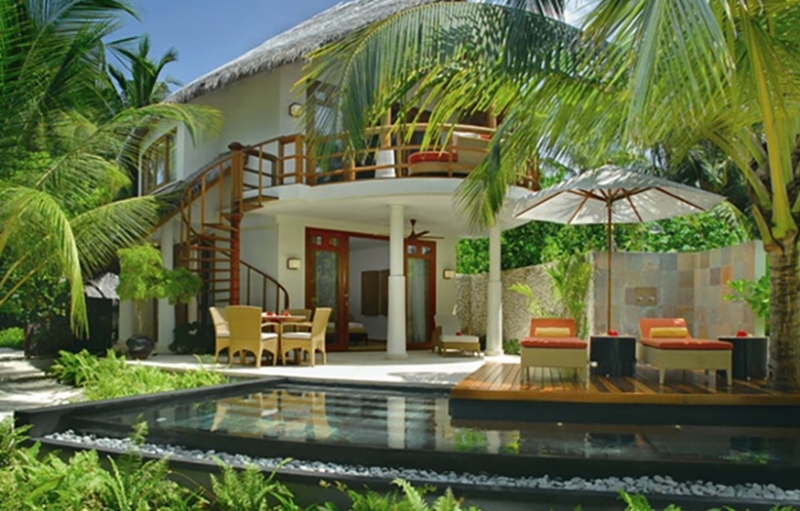 The double storey beach villas are ideal for families - not forgetting here the kid’s club for 4-12 year olds. One other aspect I would like to highlight is the media set-up in every room. I haven’t come across better anywhere. There is a single, small and simple handset that controls everything via an intuitive interface on the large tv screen. One can run through the satellite channels, choose a film, select some digital music, go online or find out resort information such as excursion options and restaurant menus. Simply excellent. 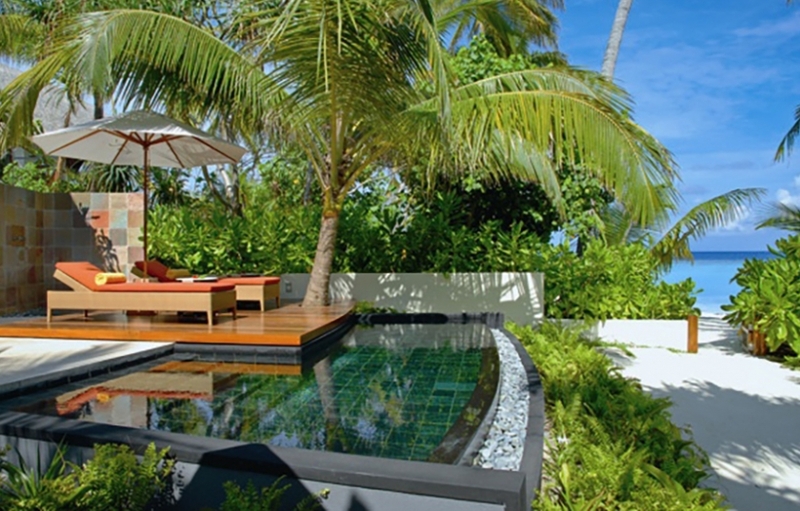 Indeed, ‘simply excellent’ and ‘naturally elegant’ sum up Constance Halaveli well. This is out of the price range for most holiday -makers to the Maldives but if you have the means and are attracted to classic over rustic or minimalist, then this has everything you could hope for.